We Drink Your Milkshake! : First Films of Dallas VideoFest 27 Announced! First Films of Dallas VideoFest 27 Announced! Last year, Jonesy and I attended our first Dallas VideoFest. To say that it was an interesting experience is an understatement. The vibe of the fest is unique and has some memorable movies and it's not the standard indie fare that you see in the festival circuit. This year, they seem to be trying to extend their physical reach by having screenings all over DFW during various dates. While I'm not pleased with this since it's a pain to get around. Either way, it's going to be interesting to see the different venues, but what's more interesting is the movies announced in this first wave of announcements. Check them out after the break. DALLAS, August 20, 2014 —The Video Association of Dallas announced today the first films chosen to screen during the 27th edition of the Dallas VideoFest from October 8-19, 2014. Overall, approximately 175 videos including narrative and documentary features, shorts, animation, and experimental videos will be screened during the expanded 12-day Festival. This year’s films will run the gamut from documentaries about the simplicity of expressive dance to the absurd history of theme songs for professional wrestlers. VideoFest will also showcase student Academy Awards winners: Helen Hood Scheer (APOTHECARY) and J. Christian Jensen (WHITE EARTH). The FBI was unaccountable and untouchable until 1971, when a group of ordinary citizens uncovered its illegal domestic spying programs. Forty-three years later, these everyday Americans publicly reveal themselves for the first time and share their story in the documentary: 1971. As celluloid film slowly disappears from her workplace, the director, a movie projectionist herself, begins to investigate what makes the material special. COTTON ROAD follows the commodity of cotton from farm to factory, across industrial landscapes, to illuminate the human experiences within a global supply chain. An intimate and nuanced investigation into the life of one of the most influential and provocative thinkers of the 20th Century. Worlds apart, a five-star chef, a twelve year-old girl, and a retired schoolteacher discover how their individual efforts to feed the poor ignite a movement in the fight against hunger. Three kids in the streets of a city in Africa. A mafia-like gang. Fights. The smallest kid kills his stepmother. The kids flee; the journey begins. Maybe the wild years will not come back. A heartfelt journey of award-winning filmmaker Sterlin Harjo as he interweaves the tale of a mysterious death in 1962 with the rich history of the powerful hymns that have united Native American communities in times of worship, joy, tragedy, and hope. 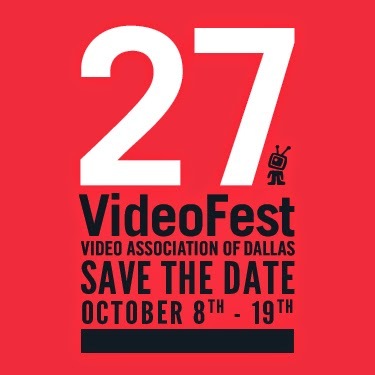 VideoFest officially opens at Dallas City Performance Hall on Wednesday, Oct. 8. For the first time ever, the festival will be in three locations throughout the 10-day long run from Alamo Drafthouse Cinema in Richardson, Friday Oct.9-12th, Oct. 13th, University of Texas at Arlington, Oct 15th, South Dallas Cultural Center and wrapping up at the Angelika Theater, Friday, Oct. 16th-19th. VideoFest (VideoFest.org) is now the oldest and largest video festival in the United States and continues to garner critical and popular acclaim. VideoFest prides itself on bringing films to the theater that are rarely available to be seen anywhere else. Films like Experimental/Art Films, Animation, Narrative and Documentary Shorts as well as Documentary and Narrative Features and some hard-to-find Classic TV episodes and Classic Films are often in the mix. Merging art and technology since 1987, VideoFest has specialized in independent, alternative, and non-commercial media, presenting hard-to-find works rarely seen on television, in movie theaters, or elsewhere, despite their artistic excellence and cultural and social relevance. Even in a Web 4.0 environment where everything is seemingly available on the Internet, the VideoFest provides curatorial guidance, a critical voice in the wilderness navigating the vast and diverse landscape of media, helping to interpret its cultural and artistic significance. The event provides a communal environment for real-time, face-to-face dialogue between makers and audiences. Alamo Drafthouse Cinema–Richardson; Alford Media Services, Inc.; AMS Pictures; Angelika Film Center Dallas; B Marie Designs; City of Richardson through the Richardson Arts Commission; Common Desk; Dallas Convention & Visitors Bureau; Dallas Film Commission; Dallas Office of Cultural Affairs; FilmFreeway; KellyKitchensPR.com; KERA/KXT; Selig Polyscope Company; Sell.com; SullivanPerkins; Texas Commission on the Arts; Texas Film Commission TheaterJones. The mission of the Video Association is to promote an understanding of video as a creative medium and cultural force in our society, and to support and advance the work of Texas artists working in video and the electronic arts. The Video Association of Dallas (VAD) is a 501(c)(3) organization incorporated on April 25, 1989. It began in 1986 as a weekend event, “Video As A Creative Medium”, presented at the Dallas Museum of Art by independent curators Barton Weiss and John Held. That first event, which included two nights of video by selected local and national video artists, was a great popular success, which led to the founding of the Dallas Video Festival (DVF) in 1987. Video Association of Dallas also presents the 24 Hour Video Race, the Texas Show Tour, North Texas College Film Festival, Texas Fllmmakers Production Fund workshops, Three Star Cinema, and other programs throughout the year.